• Dimension: 37 (L) X 25 (W) X 48 (H). • Power: 1.5 Volt x 2, AA size battery. • Fan/Wind Wheel: Fiber wind wheel, diameter of 430mm with breaking resistance track, consists of adjustable tension strap with control knobs. 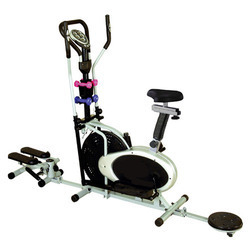 Consists of handle bars which can also have independent cycling, strength of an elliptical, ergonomic handle bar consists of adjustable tension strap with control knobs, consists of big monitor with 5 function : speed, time, distance, calories & pulse, addtional steppeer and twister. • Dimension: 86 (L) X 25 (W) X 61 (H) Unfold & 48 (L) X 25 (W) X 61 (H) Folding. • Crank Assembly: 1 Piece Crank Assembly. We are Imorter of ORBITRAC in India. 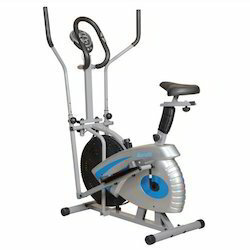 Catering to the requirements of our clients, we are involved in offering Aerofit Exercise Bike.